Winter is finally moving out and spring and summer are moving in. It's time to get your swimming pool back in shape, and the good news is this is a lot easier than many new pool owners may think. Here is a quick and easy way to get your swimming pool ready for months of fun. Remember, it takes a couple of days to properly open a swimming pool, so plan ahead. Most pools have a covering and its time to remove it and store it. Before removing the cover brush it off to remove debris and remove as much water as possible (if water is present; you can use a pump if there is a lot of water). If the water level has dropped in your pool, slip a hose under the cover and fill until the level is halfway up the skimmers. Now, you can remove the cover. Set the cover in the sun and let it dry before folding. This will prevent mold and mildew from forming on it. Store it in a dry, cool place. Remove any freeze plugs that were installed and replace any directional fittings that you removed. Remove skimmer guards and replace the ladder and accessories if needed. Open the relief valve on the filter before starting the pump and let air escape. Look for a steady stream of water and then close the valve. If you removed any of the mechanical parts of the system, replace them now. Open the lines on the return lines, skimmer lines, and main drain. This is a good time to do any required maintenance on the pump and filter. Now, you can start the filter system. Using your skimmer net remove any debris from the surface of the water. Brush the sides and floor of the pool and then vacuum up the bottom of the pool. Tip: After this first cleaning, let the filter run for 24 hours to circulate the water. Note: Always follow the manufacturer's instruction and this applies to storing your chemicals as well. Some chemicals should never be stored together or close together. The next day, use a water testing strip to get a base line reading. Dip the strip well below the surface. Remove from pool and compare the strip to the color bar provided with the kit. Total Alkalinity shows you how well the water resists changes in the water's pH level. You want a reading of between 80 and 125 ppm (parts per million). If the reading is low, add Total Alkalinity Increaser; if the level is high, add pH Decreaser. Wait two hours and then check the pH level again. The pH level should be between 7.2 and 7.6. Make adjustments with either pH Increaser or pH Decreaser. Next, check and adjust water hardness. If level is low, add Calcium Hardness Increaser; if the level is too high, you have to drain some water and add source water that has a lower calcium level. Now, we need to get the chlorine right. 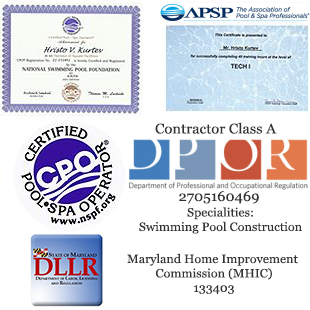 Chlorine is what kills the bacteria, germs, and viruses in the water and makes swimming in the water safe. Keep in mind that the Sun's rays will affect the chlorine so you should use a chlorine stabilizer first. Add this to the pool to get a reading of at least 30 ppm. Once the stabilizer is working, add granular chlorine to the water. This is best done in the morning or evening and the pump needs to be running. Add algaecide to prevent algae from growing. The next day, test your chlorine level again. Adjust with granular chlorine (if needed) to get a reading of between 1 and 4 ppm.